Since most of us have been waiting for it for a VERY long time, we’ll let you know up front that a new Collections feature, which will allow you to organize not only your Kindle books but your movies and other content in your own custom categories, is coming to these new HDX Fires as part of a free software update scheduled for a mid-November release! 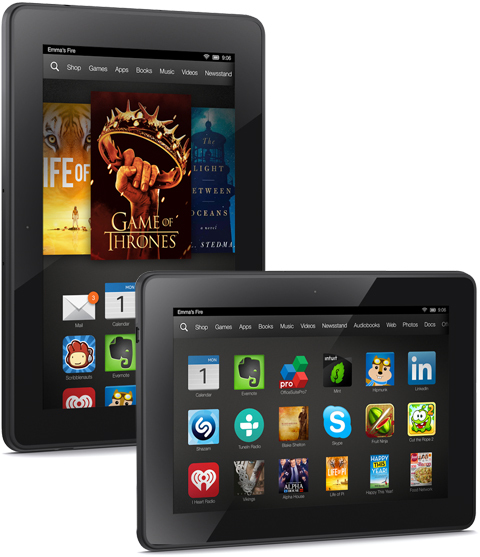 No word yet as to whether or not this type of update will also be released for first-generation Kindle Fires and Kindle Fire HDs, but it’s possible the new features are dependent on the HDX’s upgraded processing chip and software. We’ll keep an ear to the ground on this and let you know if we hear anything more about it before the update is released. – On-board ‘Mayday’ feature is like OnStar for your Fire: instant connectivity to tech support! Note that a LOT of people are visiting these pages today, so they may be slow to load.